Coming just weeks after the dreadful loss of Wales manager Gary Speed, the interview has again focused attention on the mental health of sports stars. Professional athletes undoubtedly face unique problems, but it would be a mistake to think this is just football’s problem. One out of every 5,700 men will kill themselves in any given year. The rate is between three and four times higher for men than for women, and highest among men under 35. In recent years, suicide has become the single largest cause of death for young men, overtaking even road traffic accidents. In the UK, more people die from suicide every decade than have ever died from HIV/Aids. While politicians and health services could certainly do more, surely we have a wider responsibility as a society to examine how we implant and enforce the damagingly rigid, insular stoicism that underpins our understanding of what it means to be a man. Most of us recognise that women’s sexual continence has been traditionally policed by prevailing social attitudes, but it’s less often observed that men’s emotional continence is policed in a very similar way. As I’ve written before, attempts by men to address their own gender-specific issues are often greeted with hostility and disdain. Last year, the deputy prime minister, Nick Clegg, revealed that he sometimes shed a tear listening to a moving piece of music, and that he took personal attacks to heart. The response from some journalists, such as Christina Odone in the Telegraph, was vicious attacks on a “blubbing big boy”. Jane Powell of the brilliant charity Calm, who knows more about this issue than most, responded: “Telling men that they should at least pretend to be invincible, shouldn’t show feelings, should be strong and silent if they want to be a ‘real man’, is destructive, selfish and plain nasty.” Even the Guardian is not immune. Recently one professional attempted to bring a successful Australian scheme to the UK, which uses the imaginative hook of garden sheds to get men discussing and addressing their own mental health and wellbeing. The response was an article mocking the very idea that men might need help, and demanding to know why it wasn’t being offered to women instead. The number of suicides and prevalence of suicidal tendencies is rising faster among older men than in any other age group, according to research released in the week the government postponed its suicide prevention strategy. Data from the Office for National Statistics (ONS) shows that the number of suicides among men aged over 55 has risen by 12% over the past decade, while suicides by men aged under 34 dropped by 30%. The mental health charity Calm said men aged 45 to 54 were still most likely to seriously consider taking their own life. Charities and mental health experts are concerned that across all age ranges there are far more male than female suicides. Jane Powell, the Calm chief executive, speculated that the recession might be having more of an impact on older men. “If you are middle-aged just now and your job and life prospects are diminishing then this is tough,” she said. “There is work to show that the impact of unemployment hits men harder, and later on in life; that it’s easier for women whose lives are not necessarily defined by work and for whom part-time or temporary work isn’t by definition bad. 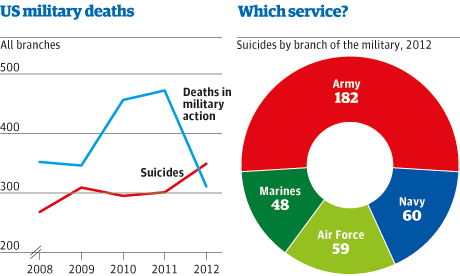 Official statistics show that 4,517 people in England and Wales killed themselves in 2010, of whom 75% were men. Powell said there were two reasons for the discrepancy. “First, because men are by default supposed to be in control, in charge at all times and so therefore needing help is by definition unmanly. Calm, which began as a Department of Health initiative in 1997 and became a charity in 2006, has traditionally focused on reducing suicide among young men. Now it is changing its remit to include the older generation. According to a YouGov survey carried for Calm of adults who had considered taking their own lives, a key driver was relationship status. The number of children in a household was also a factor with 18% of men with one child expressing suicidal thoughts, compared with 27% with three or more children. The government planned to launch its suicide prevention strategy last week but postponed the initiative until September. Catherine Johnstone, chief executive of Samaritans, said: “There is strong evidence to show that interventions to support people at risk of suicide make a difference. However, it is often the case that services are failing to reach and engage men, which is why Samaritans launched a campaign in late 2010 to target working-class men who are the most at risk. Last week it emerged that people in Manchester were more likely to kill themselves than in any other city. At a public meeting called by Manchester Users Network, a group for people with mental health issues, participants criticised cuts to services, in particular community centres, which act as lifelines to people with depression.